How would one live consuming only food and drink produced locally? A key idea in bioregional thinking is the foodshed – defining the geographic region that produces the food for a particular population. In the era of globalisation the foodshed for most people in the rich part of the world is the entire globe, a trip to our ‘local’ supermarket offers us produce from Morocco, Mexico, Chile, Kenya, New Zealand… You can live in a rural location surrounded by agricultural land and yet find nothing grown in the fields you see in the shops you use. Freighting foodstuffs about the globe is possible because of cheap labour abroad and the speed of fossil-fuelled transportation. As consumers we get cheap food, ‘seasonal’ foods like asparagus, grapes or strawberries all-year round and exotics like avocados and bananas and coconuts. There are other costs though – the local farmers that can’t compete and go out of business, the farm workers on the other side of the world living on low wages, the unknown production processes in out-of-sight locations, the pollution produced shipping or flying food internationally. One alternative is to become a ‘locavore’ to, against the norms, try and source most of what we eat from our local area – to eat a ‘Dengie Diet’. This definition of locality might mean a number of things – just the peninsula? 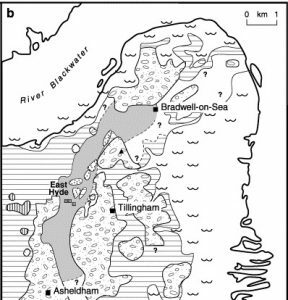 or a wider radius like the 10 miles about Burnham-on-Crouch shown in the map above. Our start is with our garden which contains a few apple trees, a plum, a quince, raspberry canes, strawberries, asparagus and a greenhouse in which we grew tomatoes last year. Then there’s our allotment plots with more apple trees, a cherry tree, a greengage, blackcurrants, gooseberries and last year tomatoes, brassicas, squash, potatoes, carrots, beetroot, courgettes and more. There also wild harvest opportunities in the are a for blackberries, plums, crab apple and samphire. Our annual base load comes from a weekly veg box of seasonal organic vegetables grown on the Essex coast from Sarah Green’s Organics in Tillingham. The Limes Farm Shop provides fruit and veg from an old style market garden in Burnham. I’m also a shareholder of Lauriston Farm, a biodynamic and organic farm located just outside the Dengie, north of the Blackwater at Goldhanger – which produces beef and lamb. Our local supermarket is actually an East of England Co-operative Society store (I’m a member) which has a ‘Sourced Locally‘ initiative bringing locally produced foodstuffs into their stores. As the co-op covers three counties Norfolk, Suffolk and Essex, sometimes the stuff sourced ‘locally’ doesn’t feel that local – sourced regionally might be a better way of describing it. That said, recently they have been stocking more from local producer Dan Hull Prepared Foods which uses local suppliers in Essex. Burnham also has a monthly Farmer’s Market on the 3rd Sunday of each month featuring local suppliers. Salt marsh lamb is a speciality of the area and produced by several local farms. Salt itself in a local speciality with the famous Maldon Sea Salt produced in the eponymous town. I like to drink real ale and we are well served on the peninsula by a number of breweries: my closest is Wibbler’s Brewery in Southminster but there are also Crouch Vale Brewery in South Woodham Ferrers (creators of my favoured tipple Brewer’s Gold), Mighty Oak and Farmer’s Ales (both in Maldon). The Dengie is also increasingly a wine producing region with New Hall Vineyard at Purleigh, Clay Hill Vineyard and Crouch Ridge near Althorne and Martin’s Lane Vineyard by Stow Maries.